She was the spirited daughter of a North Carolina plantation owner, and he was a poor fisherman who she tutored on the porch of her family’s Nags Head cottage. When we last saw Abigail Sinclair and Ben Whimble at the close of The Outer Banks House, they’d overcome their differences in life stations and defied convention to begin their new life together. But now it’s seven years later, and Return to the Outer Banks House finds the couple married and in hard times—riddled by poverty, miscarriages, and weakened family ties. The strong bonds that once held them together have eroded over time, and their marriage threatens to unravel, particularly when relationships from the past and ambitions for the future find their way into the mismatched couple’s present predicament. Can their love survive? Or are the challenges they face insurmountable? Return to the Outer Banks House carries readers back to 1875 to answer these questions and explore the ebb and flow of a rocky marriage set against the enchanting North Carolina shoreline. Replete with history, intrigue, and plenty of maritime drama, it’s an evocative tale of struggle in the Reconstruction-era South. Diann was born in Indiana in 1971, but she spent the majority of her childhood in Newport News, Virginia. She majored in English literature at the University of Virginia, but she never wrote creatively until, after the birth of her second child in 2003, she sat down to write The Outer Banks House. She soon followed up with her second book, Chasing Eternity, and in 2015 the sequel to her first novel, Return to the Outer Banks House. Diann has vacationed on the Outer Banks since the age of three. She even married her husband of 10 years, Sean Ducharme, in Duck, North Carolina, immediately after a stubborn Hurricane Bonnie churned through the Outer Banks. Conveniently, the family beach house in Kill Devil Hills, North Carolina provided shelter while she conducted research for her historical fiction novels. She has three beach-loving children and a border collie named Toby, who enjoys his sprints along the shore. The family lives in Manakin-Sabot, Virginia, counting down the months until summer. 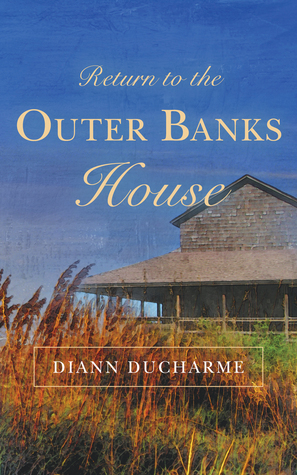 In Return to the Outer Banks House, Diann Ducharme brings us back to Nag’s Head seven years after we first met Abigail and Ben in The Outer Banks House, but this novel, set against the Reconstruction of the South is also about the deconstruction of a marriage. The lovers from the first novel have gone through so much, that it’s actually pretty realistic that their relationship is strained, and I applaud the author for writing such an open, honest story, and trusting that we readers will get it. At the same time, though, the ultimate resolution of Abbie and Ben’s issues is a sad one, and comes as a bitter blow after all the love and hope that existed between them in the first novel. Ducharme does give us a secondary character to follow, Eliza, replete with her own love story, but while she’s an interesting character, it’s not quite the same, and I felt like the whole tone of this book was a subdued one. Still, it was a great read, even if the ending wasn’t what I expected. Ducharme’s descriptions of the land and sea and sky are almost photo-realistic, and this novel is almost worth it just to get to read more of that. As well, she continues to excel at writing dialogue that feels both natural and period at the same time, using dialect effectively to show differences in class, status, and origin. This novel can be read alone, but is much more effective, and makes more sense, if you read The Outer Banks House first, though, now that I’ve written that, I wonder if the focus would be more on Eliza, and the readerly response a bit brighter if it’s read as a standalone, without the investment in Abigail and Ben as the primary couple in the tale. Something to ponder, I suppose. Again, this novel takes place at the shore, but it isn’t at all a typical “beach read,” and I believe it will appeal both to casual readers and those who prefer more literary fiction. Goes well with fresh caught fish, homegrown tomatoes, and sweet corn. Return to the Outer Banks House, by Diann Ducharme (@diannducharme) #review @hfvbt by Melissa Bartell is licensed under a Creative Commons Attribution-NonCommercial-ShareAlike 4.0 International License.